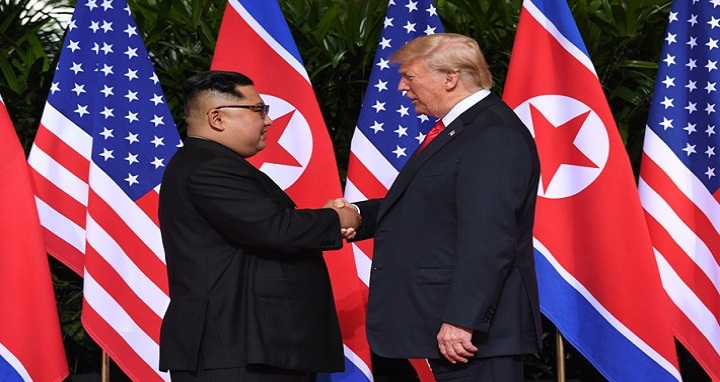 Dhaka, 13 June, Abnews: Korean-Americans in the Los Angeles area, which has the largest number of Koreans outside Asia, appeared cautiously optimistic on Tuesday (June 12) following the historic summit between President Donald Trump and North Korean leader Kim Jong Un. "It was a good meeting," said Yuri Kim as she stood outside the South Korean consulate in Koreatown, holding her two-year-old son in her arms. "It's just the beginning I hope." Kim, who immigrated to the United States four years ago, said she was hopeful the unprecedented summit between the two leaders will lead to the denuclearisation of North Korea. "I don't know much about him but he doesn't commit to big corporations because he's rich, he doesn't have a political background, he doesn't need to persuade his party," she said, referring to Trump. As to Kim Jong Un, she believes that since his meeting with his South Korean counterpart "he's trustable and consistent." Kwang Yoon, a 59-year-old engineer, said the summit marked a "first step" toward a lasting peace. "I'm excited but you can't solve everything in one time," he said. "If you don't (talk), you get into many misunderstandings." The encounter between Trump and Kim Jong Un led to a joint statement in which both countries pledged to pursue the denuclearisation of the Korean Peninsula. Trump also said the US would halt military exercises with Seoul - something long sought by Pyongyang, which claims the drills are a rehearsal for invasion. Sean, who was born in North Korea, said he has lived through many failed attempts at peace on the Korean Peninsula and was hopeful this latest bid would be successful. "I used to hope," said the 90-year-old, who refused to give his last name for fear of the regime in Pyongyang. He said he was pinning his hopes on the youthful age of the North Korean leader, who is in his mid-thirties and seems ready "to change his position." For Jeffrey Wang, who works as a cook at a restaurant in Koreatown, the summit was a welcome development though he remains skeptical about the final outcome. "I don't trust Kim Jong Un, we don't trust North Korean people," he said. "We are at war." North and South Korea remain technically at war after the 1950-53 conflict ended in an armistice that Seoul's then leader refused to sign and divided the peninsula along the Demilitarised Zone (DMZ). The conflict has also divided many families that have never been reunited. "It's very painful to have to live like that," Yoon said. "I hope both Koreas can eventually live together. "It's one nation with the same language, the same culture, the same people." Born in 1928 in what is now North Korea, Sean fled to the South in 1947 with his parents at the age of 18 and settled in the United States in 1978. He said his older sister stayed behind in North Korea. "She is probably dead," he said, matter-of-factly, adding that there was no way to communicate with her since they were separated. "So many people have had the same experience," he sighed. "I feel terrible about North Korea," he added. "They have no freedom, they cannot even talk to each other. They cannot trust each other. "I don't know how they can change their policies, educate people." Roy Lee, 18, who was born in the US to Korean immigrants who own a restaurant, said he felt little concerned by the summit though he cared about the safety of his extended family in South Korea. "Uniting Korea would be a good thing but I don't really trust Kim Jong Un because he never talked about uniting Korea before Trump," he said.